The ability to accurately and precisely measure long distances is fundamental to many professions, but it is especially crucial for all those involved in construction. From the engineers and architects involved in the planning and development stages, to the contractors and builders who are charged with the task of executing those plans and refining them, understanding the physical dimensions of a project is crucial to its completion. Nonetheless, it is challenging to accurately obtain these measurements only from small measuring tools, like tape measures or meter sticks, because they lack the necessary millimeter precision. Not only that, small positioning mistakes with these tools can lead to disastrously incorrect measurements, and measurement by hand with these small tools is incredibly tedious. Instead of relying on this out-dated system, engineers, architects, contractors, builders, and more, all rely on laser measuring tools in order to properly measure distance. Why Are Laser Measuring Tools Useful? The biggest draw for using laser measuring tools is that they are accurate, especially when the device is properly calibrated and when the proper technique is used, and they can be used by a single person. Not only that, these tools are very portable, sometimes even small enough to fit in your pocket, and they don’t require much power to run, and they can very cheaply be powered using electricity or batteries. Laser measuring tools are programmed to measure the time it takes for a laser pulse to reach a target and to be subsequently reflected back to the device. The tiny internal computer then calculates the distance between the user and the target object based on the time that it took for the laser pulse to be reflected back. More sophisticated tools can even go a step further, calculating the area and volume of a space once all the appropriate dimensions have been measured. This means that in order to operate your laser measuring tool, all you need to do is set your laser up at the start of the distance you want to measure and direct it toward a target object at the end by focusing the laser point with the viewfinder. To increase the accuracy, you can do multiple measurements and take the average, or you can apply the indirect Pythagoras technique and measure several points around your desired length to get the measurement you need more accurately. In many instances, laser measuring tools will come with a special case. This case can be made from a variety of materials, but usually, it is made with a foam material that can cushion the tool inside a tool box. If you have a more advanced model with extra accessories, including stabilizing arms or tripods, you might also find that a hard case to keep all these pieces stored together is a better option. The only real risk that these tools present is the damage that lasers can cause. When operating a laser measuring tool, it is important to never look directly into the laser because this can cause serious eye damage. While all laser tools work off of the same physical principles, they do not have all the same additional features. These features are key for adapting the device to your needs, be it for a professional or a home project. Because one of the most important aspects of using a laser measuring tool is positioning the laser beam for accurate measurement, being able to pinpoint a precise location can be crucial. This is why many modern tools are equipped with a camera that you can use to visualize the exact location of the laser. However, focusing the laser from a long distance is challenging, even with a camera. To correct for this, finding a camera with the ability to zoom in on the object can be especially useful. This is the most modern feature that you’ll find with laser measuring devices. They allow you to send the data from your measurements to your smartphone or tablet so that you can create custom floor plans quickly and without the hassle of drawing it up yourself. Managing all the details of a project can be demanding, and when you need to take multiple measurements at one time, you can risk transcription errors that can cause problems and delays down the line. This is why a device that is capable of storing the data of your project as you go. With all the above information in mind, let’s now take a look at several of the best outdoor laser measures that are on the market. The best choice for each situation will vary slightly, so you will ultimately want to consider the details of your project in order to make the final decision. Leica is the oldest and most well-known brand in laser measuring tools. One of its most popular innovations comes with the DISTO series, which are all programmed to be compatible with the smartphone and tablet app by the same name. This DISTO app allows you to virtually construct your floor plans directly from the measurements you take with the laser measuring device. 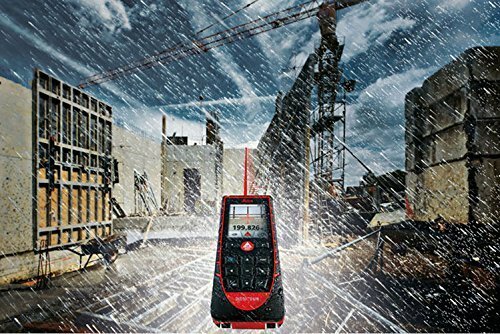 This particular Leica LEIAD Disto x4 laser distance meter is a lightweight model with the ability to measure in imperial and metric units. It has a tilt sensor feature that will help you to keep the device perfectly aligned as you make your measurements. Not only that, the tilt sensor controls the orientation of the display, making it easier to read the screen, no matter which direction your tool is facing. The LEIAD also has a viewfinder that can zoom in on the target with a x4 focus, helping you to focus from a distance. Better yet, the LEIAD is has a site proof design to protect it from falling or from getting hit in the event of an accident. With water jet protection, the LEIAD is also easy to clean. The Stabila 6520 laser distance meter has the capacity to measure up to 656 feet with precision of up to two inches. 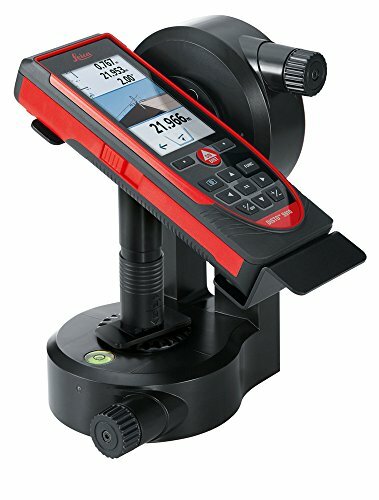 It is lightweight and compact, making it easy to store with the rest of your tools, and it has an LED screen that is easily visible in the sun as well as the capacity to calculate distance based on certain indirect methods. Better yet, the Stabila 650 is Bluetooth and iPhone compatible, featuring an app that allows you to store and manipulate your data for all your various projects. 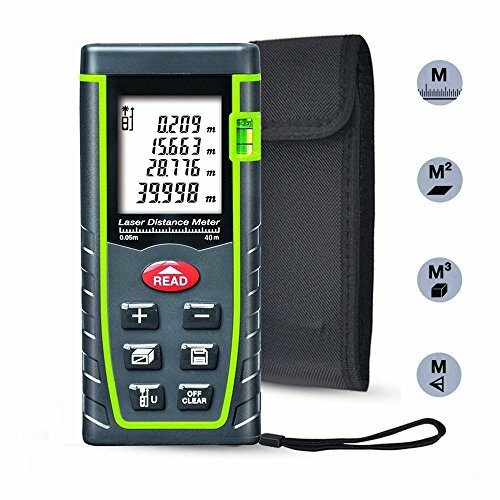 The ieGeek model is an easily portable laser distance meter with multiple reading modes and calculation capabilities. With this device, you can carry out continuous measurements, measure the distance between objects directly or indirectly with a Pythagoras function, and calculate area and volume based on your measurements. This ieGeek model is able to measure distances up to 328 feet within 0.08 inches, and it is able to do so in both the imperial and metric systems of measurement. Better yet, the body of the ieGeek meter is waterproof, making it easy to clean, and the laser is dust proof, making it usable no matter the on-site conditions. 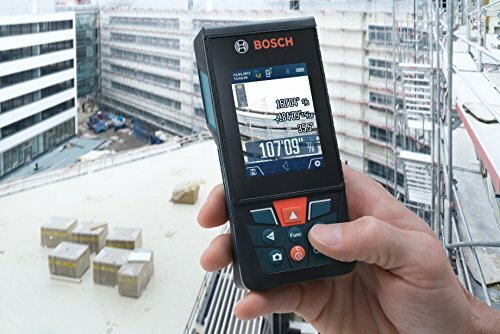 The Bosch GLM400CL Blaze Outdoor laser meter, is equipped to measure up to 400 feet within one quarter of an inch. It has eleven different measuring functions, including real-time length measurements and static length measurements as well as the ability to calculate the length, area, and volume indirectly. The calculator also has addition and subtraction capabilities, helping you to visualize the adjustments to your project’s dimensions as needed. What’s more, with a special tilt sensor, you’ll be able to visualize the angle of the pitch so that you know when the tool is level and ready to use. Not only that, the Blaze is one of the most modern laser meters on the market. The Blaze features a 5.0 megapixel camera that can help you to not only visualize your targets, but also to document them for later reference. The device is also compatible with a smartphone and tablet app that you can use to store and manipulate your data when you leave the site. Finally, it also comes with a lithium battery that can be recharged at the end of every day. 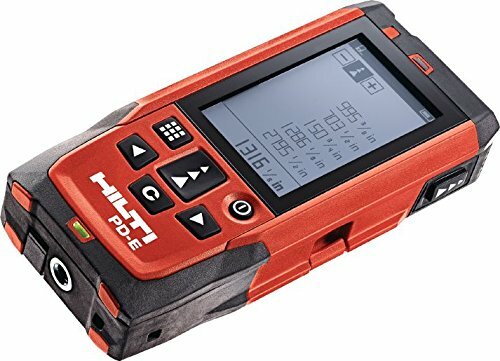 The Hilti 2062051 PD-E laser meter is a simple but effective model. It can measure up to 656 feet with an accuracy range of 0.04 inches. It features a tilt sensor for keeping the device level as you make your measurements, and it features a hand strap that can be used to hang on to the tool when you’re onsite. This straightforward model is powered by 2 AAA batteries, which can be used for up to 5,000 measurements. The Leica 855138 DISTO laser distance meter can be a powerful tool when it is coupled with the DST360 point to point accessory. Alone, this Leica laser meter comes equipped with a camera that can be zoomed in on your target up to four times, which you can control with a 2-inch, high resolution screen. Better yet, it is certified for drops of up to six feet, making it reliable even after an onsite accident. It is also easy to clean with its water jet protection, and the laser is guaranteed to work even in dusty conditions. Finally, like all recent Leica laser distance meter models, the 855138 DISTO laser meter is compatible with the DISTO app for smartphones and tablets. This app is designed to allow you to quickly draw up floor plans based on the measurements that you make on site. When coupled with the DST360 point to point accessory, you can improve the accuracy of the meter’s measurements. This accessory boosts the tool’s ability to measure with triangulation, based on the indirect Pythagoras method, even with small obstructions to the laser’s beam. This device also allows you to measure in both the horizontal and vertical directions. 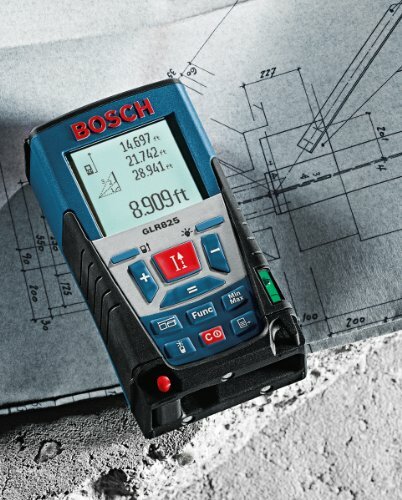 With the capacity to measure distances of up to 825 feet with a 0.04-inch accuracy, the GLR825 Bosh laser meter has one of the longest ranges on the market. With several measuring modes that are directly linked with an internal calculator, you can use this tool to find simple lengths, areas, and volumes using either a single-read or continuous mode with a single indirect or double indirect method. These measurements can be done on single surfaces, but they can also be done using the multi-surface option that can calculate the total area of multiple individual surfaces using a common length or height. On top of that, there are modes for finding minimums and maximums, stake outs, and the area of trapezoids. To make it easy to obtain these measurements, the GLR825 uses a 1.6x viewfinder and an illuminated display that is visible even in the sun. What’s more, this Bosch model also features a small amount of internal storage, allowing you to store up to 30 measurements. The Leica DISTO S910 has the absolute longest measurement range on the market with the capacity to reach up to 984 feet with a 0.06-inch accuracy. The device is equipped with a 4x zoom viewfinder and onscreen targeting capabilities using a cross hair. The base of the DISTO S910 can be used for stabilization, and the novel P2P technology can give you information about the distance, angle, and slope distance between any two targets. 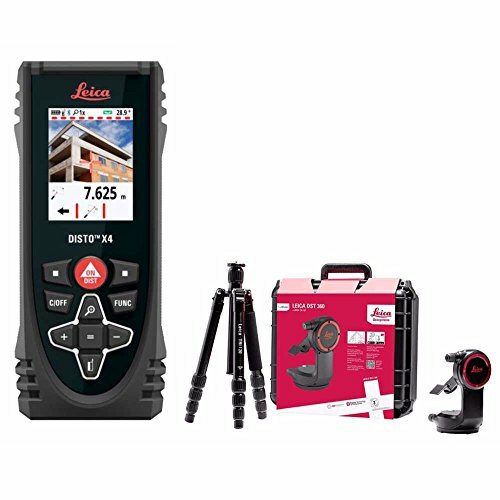 As with all Leica DISTO devices, you can also connect this tool with your smartphone or tablet to save your measurements for later use. 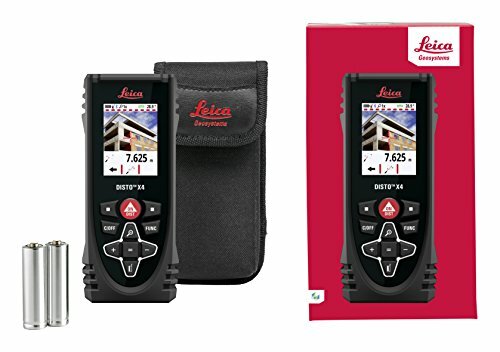 The Leica DISTO E7500i laser distance meter is capable of measuring distances up to 650 feet with an accuracy of up to 0.06 inches using a 4x zoom and a point finder display and a smart horizontal function that allows you to shoot over obstacles to reach your target. On top of that, the E7500i has water jet protection for easy cleaning and dust protection to keep the laser visible in all working conditions. The device be set to measure in feet, inches, yards, and meters, and it measures in decimals. Like all Leica models, it is also equipped with Bluetooth so that it is compatible with the the DISTO app that allows you to make floor plans. Laser measuring devices are among the most versatile tools in your tool box. 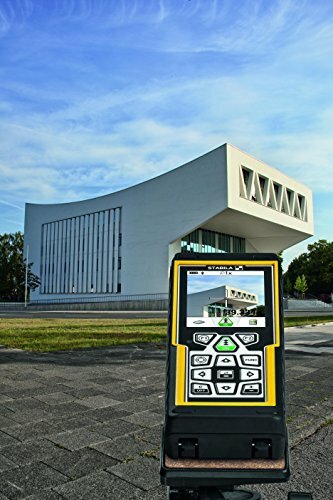 With applications indoors and outdoors, from measuring floor plans, the distance down a well, the area or volume of a room or building, planning for a new road, and more, this reliable tool is important for many professionals, and so choosing a reliable one with all the functions you need is critical.